Home > Timesheets > Timesheets - FAQs > How Does Timesheet Rounding Work? Avaza allows you to round your timesheets based on business requirements. Timesheet rounding is applied when adding time to invoices or when viewing relevant reports. When a timesheet is added to an invoice, each time entry will be rounded based on the rounding parameters chosen. If you choose Round to the Nearest or Round up to the Nearest, you can also choose the rounding interval: 6, 15 or 30 minutes. Figure: Switch Rounding on by Going to Settings > Timesheet Settings. Users have the option of choosing between two rounding methods: Round to Nearest & Round Up to Nearest. Both methods result in rounding up if the duration is less the rounding interval. 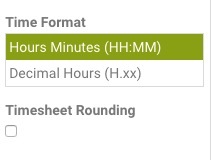 For example, if the timesheet duration is 1 minute and rounding interval is 6 minutes then both Round to Nearest & Round Up to Nearest will round the timesheet entry to 6 minutes. If you’re rounding time to the nearest 15-minute increment, we will round 20 minutes down to 15 or 25 minutes up to 30. Alternatively, if rounding up to the nearest 15-minute increment, both time entries of 20 & 25 minutes would be rounded up to 30. Relevant reports have a parameter added called “Apply Rounding”, which is switched off by default. If the user checks that flag, then rounding will be applied to the timesheet entries based on the selected parameters at the account level. This is useful to understand what the timesheet duration shown on the Invoice will be, or to calculate billable amounts more accurately.